She’s passionate, compassionate, wise and outspoken—and boy, can she cook! Just not for you. Like any good old-world mamma, Rossana Estravides stuffs her family’s hungry tummies with tasty, nutritious hot meals. Most of her family members, though, are her dogs and the ones belonging to the clients of her homespun business, PJ’s Pet Café, named for Estravides’s beloved dog. “My friend Rossana is a humble woman who loves our fur babies as much as we do,” said Mark Magdaleno, former field deputy for Councilmember Suja Lowenthal. “She loves her job—she cries when she talks about her job. She cares about her clients’ pets. I’m so proud of her—she works so hard.” Magdaleno’s little blind dog, Vinnie Valentino, is a longtime PJ’s client. PJ’s original location in downtown Long Beach. Photos by Kate Karp. The building that PJ’s had occupied for seven years had been sold, and she closed her business in November. She found herself faced with the formidable task of finding a place that would accept both the dog kitchen and the day care. But if dogs are man’s (and woman’s) best friend, then Magdaleno and a few of his contacts are best friends to dogs, and to Estravides. Alejandra Garcia, who works for the city’s Planning and Building Department and had been helpful to Magdaleno in the past, came up with a perfect location for PJ’s, on Seventh Street at Redondo Avenue. It’s immediately identifiable by the bone-shaped bike rack in front. PJ’s new location at 3412 East Second Street. Estravides thanked the individuals and city departments who helped her with her project as well as her steady clients and their human companions in a grand-opening celebration on April 22. From left: Lisa West, Third Council District’s Communications Director; Magdaleno; and Estravides’s sister, Fiorella Rios enjoy PJ’s Grand Opening Festivities. West handled the business relations for the new PJ’s. The move did tug at Estravides’s heartstrings because, as she said, “it was the beginning.” But PJ’s new location has three times the space that the former one had and affords expansion of merchandise, kitchen and concepts. Fiorella Rios, Estravides’s’ “baby sister,” designed and painted the entire space—murals, showcases, wall hangings, signage and down to the last piece of wrought iron at the counter. Fiorella’s designs grace the entire venue. The dogs may sniff past the atmosphere to PJ’s other pleasures, but the human clients appreciate it. The “hotel” area is the primo eye catcher and is the site for PJ’s day-care section. It’s designed to look like a little cosmopolitan boutique inn and is a good place for dogs who would otherwise mope at home or bark and drive the neighbors nuts. There are a couple of private rooms for dogs who don’t play well with others and a special room for cats. Private rooms are available, with bath, of course, for cats. Because of the delicate and fussy nature of many cats, their humans are obliged to place them into the condos themselves and to retrieve them. There are beds to fit the bodies of every dog who attends day care. Many of PJ’s clients are rescues, and they never had it so good—except at home, of course. Pet owners also must bring their pets’ own diet so that there won’t be any stomach or appetite issues for them. The day-care service charge covers everything, including any medications that the pets need to take. “I never charge extra for the medicines—I just cannot,” Estravides said. Speaking of diet, the way to a dog’s heart may not be entirely through the stomach, but they sure appreciate food made with love and themselves in mind. Estravides’s cakes look a lot like bakery items that people slaver over, but they’re made using only pumpkin, molasses, peanut butter and other things that are good for dogs. PJ’s cakes are as delicious to doggies as they are decorative. Main dishes include names like Sunshine’s Bacon Treats, Bella’s Turkey Pie and Sasha’s Coca Loca Cookies. Each menu item is named for a client or one of her own dogs; Peanut’s Veggie Chicken Cheese is named for Estravides’s little dog, and of course, there are two dishes named for PJ. Full menu at PJ’s. Every item is a specialty of the doghouse. Dogs can treat themselves to Estravides’s home cooking in the comfort of the atmospheric Peanut Lounge, which has been extended from the small café at the former location to an actual restaurant for dogs. Well-behaved human customers can purchase coffee and cold drinks and spend quality time with their canine buddies, and if the dogs are willing to share, I can tell you from experience that the food tastes good to people. Former Scratching Post co-writer Judy Crumpton’s dog is as fussy as a cat, and he devoured a sweet-potato dish as if it were your favorite leather pumps. We tried it, too, and it was damn tasty. Dogs can have a lunch date with their people and other dogs at the Peanut Lounge. There’s a wall full of shelves and hangers stocked with purchasable quality goods such as dog leashes, collars, clothing, cat and dog toys, pet bowls, accessories and personalized items. Estravides’s day care continues to grow in popularity and has also grown her business, which has settled nicely into its new home. She relies on word-of-mouth and old-fashioned snail mail instead of social media and fliers to popularize her business—“We need to continue to be humans. The machines don’t need to replace our brains here!”—and her clients’ recommendations work the best. But the heart of PJ’s resides in Estravides’s’ own old-school heart and genuine love of dogs. 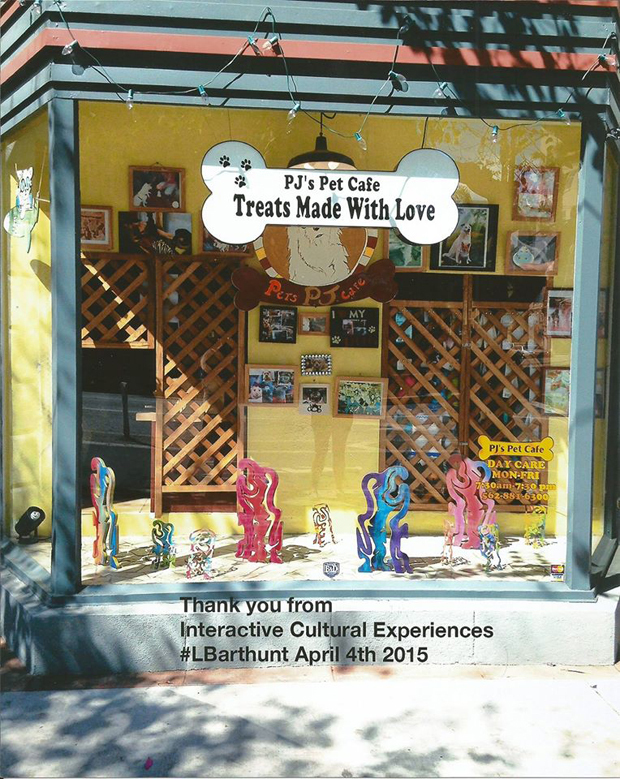 PJ’s Pet Cafe’s new location is at 3412 East 7th Street at the corner of Redondo Avenue. Hours are 7:00AM–7:00PM Monday through Saturday. To make birthday party reservations, a day-care appointment or an order for a special dish, call (562) 386-2348. Stop in for a café morning or afternoon. Don’t miss the Labrador Lasagna.